Jeremy B. Tarcher/Putnam, New York, 1996. 280 pages. After I read Once Upon a Midlife, by Allan B. Chinen, I wanted to read more that he had written. I found Waking the World on Amazon only as a used book, but I’m glad I ordered it. Like the earlier book, this book presents a series of fairy tales, and then he comments on how they apply to modern day women’s lives. 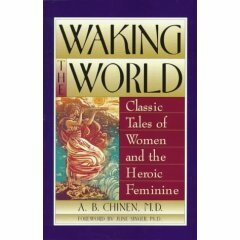 In Waking the World, Dr. Chinen looks again at adults portrayed in fairy tales. This time, he focuses on women and their role in the world. He sees archetypes and truths for all time in these tales. Indeed, it’s amazing that common themes run through the tales, from all over the world, from different cultures and times. He says, “I have grouped the tales in this book into five sections, each addressing a major theme. The first deals with power as traditionally defined in most cultures, the second with a woman’s inner wisdom, often ignored or repressed by society. Nature as a sanctuary and source of healing for women is the theme of the third section, while the fourth focuses on the ancient motif of sisterhood. The last section sums up the preceding themes and portrays reconciliation with men. With this book, you get a dozen entertaining stories that illustrate ancient wisdom. This is going to be a year of transition for me. We’ll be moving back to the States, my oldest son is going off to college, I’ll lose my job and hopefully start a Master’s program in library science, and my husband wants a divorce. Coming from a place of transition and difficulty, it was good to read about the archetypal woman’s struggle, to think that something is going on here that’s bigger than myself. I would very much like for the reunion of feminine and masculine in my life to be the restoration of my marriage. However, if that doesn’t happen, I’m going to have to reclaim some more “masculine” characteristics and face the world on my own. This book encouraged me to face the quest.